Carlos Alberto Bau was a man of many talents. Known initially as an accountant, Bau spent his spare time studying nature photography in his hometown of Mendoza, Argentina – a place of unparalleled distinct beauty. Argentina is a country still rich with untouched nature that (parts of) would still be unseen if it weren’t for artists and photographers such as Bau. Many of his subjects are the incredible landscapes themselves, but Bau also enjoyed capturing various animals during unexpected and often vulnerable moments. Some other famous still-frames include a perfect shot of the impossibly fast hummingbird about to plunge on a flower, lightning bolts, and mystic, sometimes ominous clouds hovering above an otherwise calm landscape full of boundless color. Bau reportedly died doing the thing he loved, and in the very same town. While taking aerial photographs in 2007, his plane crashed. Although Bau is no longer alive to continue sharing such beauty as we see in the tremendous force, his work continues to open our eyes to the wonders and power of nature. Some might be tempted to view the magnificent waterfall as just what it is: one of the most powerful, and deadly, natural attractions we can come close to as humans. 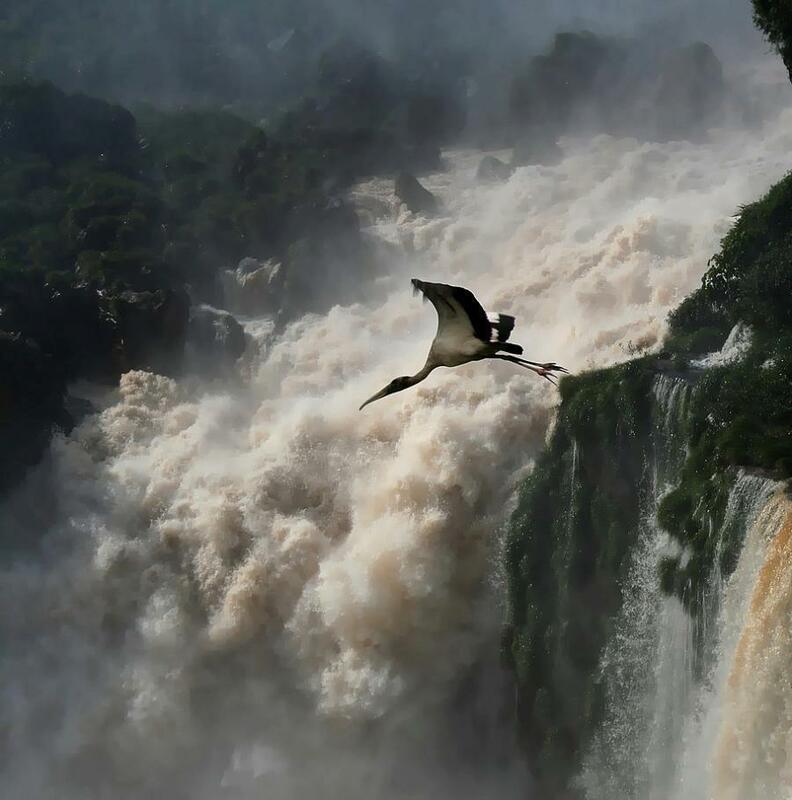 Bau secured the perfect vantage point for the moment captured in this photograph – both the monstrously powerful force of nature, and conversely, the calm and leveled preparation for the flight of a bird, soon to escape the mist. In a place where no human could safely stand, the tranquil crane only has one thing on its mind: the takeoff and its ensuing flight. 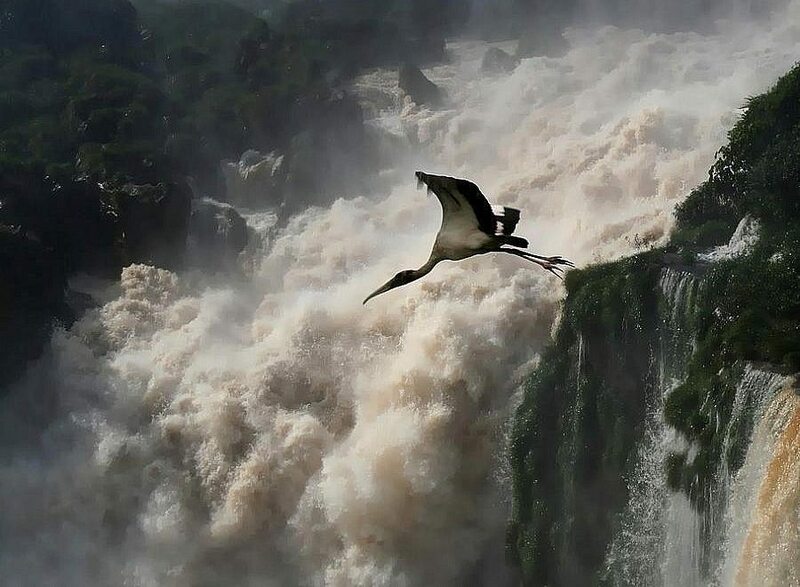 To the crane, the waterfalls are just another part of the scenery: limitless in power (and nourishment), and to be respected – just as all other animals who need or fear it do. This juxtaposition creates an asymmetrical balance for Bau’s audience, who might almost feel overwhelmed by the ampleness of focal points in this photograph, and an unexpected auditory element. The waterfall’s chaotic motion creates a a strong sensory perception, since one might imagine hearing the rumbling of a deafening waterfall when looking at the piece. Like the crane preparing for his flight, many of us find ourselves just barely rising or struggling to rise above the incredible forces of life that might otherwise swallow us whole. What do you think of this photograph? Like the crane preparing for his flight, many of us find ourselves just barely rising or struggling to rise above the incredible forces of life that might otherwise swallow us whole. The aerial shot of the crane is stunning against the backdrop of the waterfall. Bau had the rare talent as a photographer where he managed to animate the internal fears we as humans possess. Thank you for sharing this beautiful, powerful work. Loving this breathtaking photograph – your discussion of the forces of nature vs the tranquility of the crane is very insightful.